PETALING JAYA: ECONOMIC growth for next year could be affected when the estimated 500,000 foreign workers registered under the 6P programme return to their countries next month. 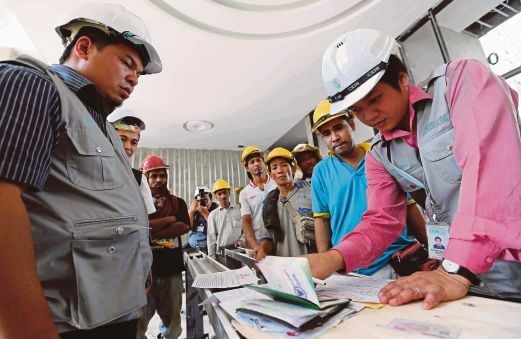 Malaysian Employers Federation executive director Datuk Shamsuddin Bardan, in painting a bleak picture, yesterday said failure to extend the work permits of these foreigners and allow them to continue working in the country would lead to the recruitment of unskilled workers to replace them. In August 2011, the Cabinet Committee on Foreign Workers implemented the 6P programme to reduce the number of illegal immigrants who entered the country illegally or overstayed their work permits. Under the Registration, Legalisation, Amnesty, Supervision, Enforcement and Deportation programme (abbreviated in Bahasa Malaysia to 6P), illegal foreign workers were required to register with the Home Ministry and had their fingerprints recorded in a biometric system. After the registration, the foreign workers were issued work permits until January next year and allowed to return to their jobs. Shamsuddin said it took between six and nine months to bring in new foreign workers, and employers would have to spend more money to retrain them. “This will affect next year’s economic growth if this matter is not handled in a positive and decisive manner,” he told the New Straits Times yesterday. He said uncertainty over the matter or if the government refused renew their permits could result in a large number of foreign workers working illegally. “Those who do not leave Malaysia by January 2015 will become illegal. According to official data, 2.5 million foreign workers are registered with the government. “From that total, an estimated 500,000 are registered under the 6P programme, which expires in early 2015. Shamsuddin said a delay in renewing the work permits could cause a lot of disruption to businesses, as time was money. Shamsuddin added that the country’s palm oil output and export earnings in the coming year would be affected if there were not enough foreign workers to harvest oil palm fruits. He said vegetable prices could also see a spike if farm owners could not renew their foreign workers’ permits on time. Two days ago, Bank Negara Malaysia governor Tan Sri Dr Zeti Akhtar Aziz announced that the economy was likely to remain on a “steady growth path”, at between 5.5 per cent and 6 per cent this year, driven by resilient domestic demand. She also forecast that next year, the Malaysian economy was likely to expand between 5 per cent and 6 per cent.